Well, it’s Professor Ceiling Cat, Emeritus, back again doing the HIli Dialogues. Thanks once again to Grania for taking over this onerous task in my absence. It’s Thursday, November 15, 2018, and National Raisin Bran Day, a cereal that I actually like, though I rarely eat cereal. And it’s good for you! 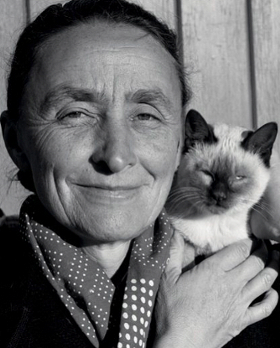 It’s also The International Day of the Imprisoned Writer. On this day in 1533, conquistador Francisco Pizarro arrived in the Incan capital of Cuzco, completing his conquest of Peru. In 1939, Franklin D. Roosevelt laid the cornerstone of the Jefferson Memorial; it was officially dedicated 3½ years later. And on this day in 1942, the Second Naval Battle of Guadalcanal ended with the Japanese scuttling their ships or absconding, leading to an Allied victory. Exactly one year later, SS leader Heinrich Himmler order that the Gypsies (Roma people) were to be treated as were the Jews and sent to concentration camps. On November 15, 1949, two of the conspirators who plotted Gandhi’s assassination, Nathuram Godse and Narayan Apte, were executed. It was Godse who pulled the trigger on January 30, 1948, sending three bullets into Gandhi’s chest. Exactly a decade later, four members of the Clutter family in Holcomb Kansas were murdered by Richard Hickock and Perry Smith, leading to Truman Capote’s famous mostly-true book, In Cold Blood. Finally, it was on this day in 1969 that Nascent Professor Ceiling Cat and between 249,999 and 499,999 other demonstrators (estimated attendance 250,000-500,000) marched in Washington to end the Vietnam War. It didn’t work then, but the anti-war movement got a huge shot in the arm. Those who expired on this day include Énuke Durkheim (1917), Nathuram Godse (1949, see above), Lionel Barrymore (1954), Tyrone Power (1958), Alger Hiss (1996), Stokely Carmichael (1998), and Lil Peep (last year). 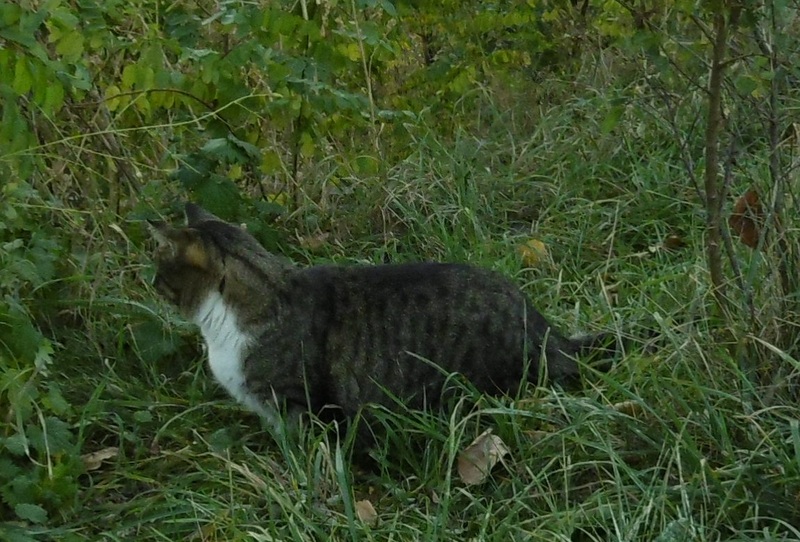 Meanwhile in Dobrzyn, Hili shows off her biological knowledge (while hunting). Hili, of course, is the apex predator. A: What do you see or hear? Hili: I’m hearing the sound of a link of the food chain. Ja: Coś tam widzisz, czy słyszysz? Hili: Słyszę dźwięk ogniwa łańcucha pokarmowego. Heather says she wants this kitty, but she’s already got the perfect cat: a neglected cat of her neighbor who spends about 90% of its time at Heather’s place. Matthew is once again hung up on an optical illusion. Can you explain what this is supposed to be doing? Are you saying that the left eye is the same colour as the jewel in the hair, but that it looks darker? Because the text doesn't say that. Finally settled . . . I have tried copying and pasting the left eyes onto the right side of the face and part of the problem which often occurs in convincing people is that the compression protocols of jpgs mean that the colours aren't pure. So ppl think they are being diddled. From reader Nilou we have one scary-looking Persian cat. Be sure to put the sound on. This entry was written by whyevolutionistrue and posted on November 15, 2018 at 7:00 am and filed under Hili Dialogue. Bookmark the permalink. Follow any comments here with the RSS feed for this post. Both comments and trackbacks are currently closed. Please stop telling people that cereals are good for them. Cereals are NOT a proper food for humans. It is dangerous that reknowned and respected biologist PCCE understands so little about nutrition. And dares to advise readers to eat toxic and unhealthy cereals. Oops, the termites have chewed into the site again. Feel free to respond to Mr. Franke, and I will inform him of the responses. Nope. Or, if so, it’s not good satire because it’s not funny. It’s also insulting. I think you are right, on all counts. Probably best to just laugh at this person. That’s about all the attention their comment is worth. It’s either that or cry. Hey, that reminds me of a horrible song that I like. I eat cookies for first breakfast, and something with grease in it for second breakfast. If it’s a fruit pie I’m pretty sure it counts towards your 5-a-day. … makes it difficult to wash the first hand? I’m no fool. I buy non-raisin bran flakes and add my own, more moist and juicy, raisins. Good lord, that cat guy is so obnoxious! I think he used to live next door to me. He ate nothing but cereal. No, I think the cat guy didn’t eat any cereal. I think the cat guy went keto and went crazy because of it because his cravings for carbs are so extreme that he lost it. I tried to go keto and became ravenous for carbs, and angry, too. Then when I gave in to my cravings, I was absolutely gluttonous for carbs and overdid it. Perhaps the “middle way” of consumption would have been better. What I want to know is why he so scared of the cat? He sounds like an adult, and he’s calling for his mother to rescue him!!! Unless he’s in a wheelchair or something and can’t get down the step, as well as being obnoxious he’s also pretty pathetic. Imagine his reaction to something really scary, like a (insect that I find so scary I can’t even write it’s name, but I’m at least capable of dealing with via insect spray. No, not a spider or weta). Insect, so presumably six legs. So, not my phobia (a centipede). But then Heather said ‘not a spider’, so she may be using the loose colloquial definition of ‘insect’ meaning ‘creepy-crawly’. Coming back to the noisy guy, though – what a wimpy obnoxious jerk. But it seems the voiceover was done satirically. The cat really does look like that, its name is Wilfredwarrior, it has an instagram account whatever that is, it’s a chinchilla persian and (IMO) a sad example of what overbreeding does. I should have said creepy-crawlie like I do on my website, but it is a six-legged thing, and you are tormenting me by making me even think of them! I thought it looked real, so it’s interesting to see that. I hate what over-breeding does to animals too. I think that’s the reason I’m not a fan of small dogs like chihuahuas or thinks like pugs, corgis etc. And I suspect an attempt at humour too, but if that’s the case it fails to work for me. The cat’s eyes illusion really is difficult to swallow. But I did a colour picker in some graphics software and it’s true; the left eyes for the first two cats really are dark grey. Damn my eyes! Or brain, whichever is responsible. Only on a physicalist understanding of colour, which is debatable, to say the least. Yes that puzzled me, too. Mark Jones’ comment, I mean. LOL, true! TBF, the girl’s eyes are pretty cat-like. In the eye illusion, the left and middle pairs of eyes look to be different colours, to me, even when they’re joined up by Janon. The eyes appear to be the same colour on the picture on the right, but they seemed, to me, to be pretty much the same colour in the original image. I wonder if colour-blindness is playing a part in those of us who aren’t seeing this properly? I’m red-green colour blind. The iris illusion is legit, but Matthew Cobb is right on – JPEG compression artefacts very much diminish its credibility here. In an image editor, I isolated all the irises and removed everything else. The compression artefacts show as local hue variations on the scale of a few pixels but overall the irises within each pair are reasonably close to each other, and are certainly without the pronounced hues perceived in the full image for the faces’ right eyes (“camera” left). That said, both irises in the third pair have a pronounced yellow-green tinge. I wasn’t saying it wasn’t legit, just that Jannon’s proof that it is doesn’t work for me. In the eye illusion, the left and middle pairs of eyes look to be different colours, to me, even when they’re joined up by Janon. The eyes will still look to be different colours even when joined up by Janon. Janon’s ‘proof’ is that he has drawn a line (of one colour) between the two eyes and even though it’s one colour it appears as different colours (for the same reason the eyes appear as different colours). I did the same thing in Photoshop, and found the same thing. They should have used a PNG. JPG is for photographs. PNG (or GIF, or BMP or myriads of others) for “line art”. It’s not a difficult rule to remember. Except, it seems, for website designers. Yes, and PNG and GIF involve lossless compression whereas JPG’s is lossy. The smoke here this morning, 75 miles from the Camp Fire, is again oppressive and a health risk. A dull orange sun and palls of smoke drifting through the trees and valley give the feel of some alien planet. For the second year in a row, I have friends who’ve lost their homes to fires. The moisture content in the air and in the vegetation is extremely low and with continued winds, the risk to all of us in these parts remains high. My car remains packed with my escape bag, vital documents, etc. During the last high wind period, PG&E shut off power to many areas, in anticipation of downed lines. The day before the Camp Fire, which completely destroyed the lovely town of Paradise and surrounding towns (home to several of my friends), PG&E announced it would not shut off power, despite a high wind warning. All indications are the fire was sparked by a downed power line. Our fire season used to run July-August. Now it begins early May. Last year, two devastating fires occurred just miles from me in October. This year, we are half way through November and desperately hoping for rain. Even among those who do not deny climate change, little is being done to address this severe and growing problem. You are so right about that. It’s astounding that politicians and oil companies are still trying to put in more pipe lines. Moving away from fossil fuel, using more plant based materials instead of oil for manufacturing, putting money into renewable resources like wind and solar etc. is where all our focus should be right now. Instead, we are destroying our planet and the future for our children. Big oil, big money. It sickens me. Your comments about cereal reminded me that CNN’s Anderson Cooper revealed on his show yesterday that he only eats cereal. I suspect he was joking. Yes, I remember seeing that bit with Bourdain. There are lots of people that have this kind of relationship with food. I find it hard to imagine but there it is. I assume that Cooper does eat foods other than cereal though. Also, he probably does enjoy eating cereal. I do as well. I sometimes eat cereal with milk as dessert following dinner. Sounds like a candidate for that “Soylent” “food substitute” sludge. Now, I’m hardly a gastrognome, but that level of monotony would … do bad things inside my head. It’s hardly a big time-sink though. I can always do something interesting while cooking/ eating. It tends to result in a fair amount of burned sludge on the pans, but if you’re quick off the mark as the sound of the cooking changes, it’s normally still edible. I agree with Anderson. I don’t care (much) about food. I eat it to stay alive, or when I get hungry, but as far as I’m concerned the actual eating is a waste of time that I could be spending doing something more interesting, like reading, or watching TV, or working on my car, or walking, or a thousand other things. And I’d rather have a burger than a steak. And there are many, many foods that nauseate me – any identifiable organs, for example (so liver, kidney, hearts, tongues, and sheeps eyeballs are right out). Unfortunately, he was lost with the steamer “President” when she sank without a trace in 1841. He was related to Tyrone Guthrie, who helped found several theatres, including the Guthrie Theatre in Minneapolis.